I’m fortunate in my travels to see some of the most beautiful destinations in the world, and I often find myself lost in my own thoughts at these places, mesmerized by their beauty. But sometimes, especially when I visit manmade structures, I can find myself transfixed not only by their beauty, but by their stories. I think of the human spirit that went into their construction and how stone and mortar often contain untold histories. September 2017, panorama from 3 vertical images, additional exposures for highlights, focal length 16mm, aperture f/11, shutter speed 2 seconds, ISO 64, tripod. 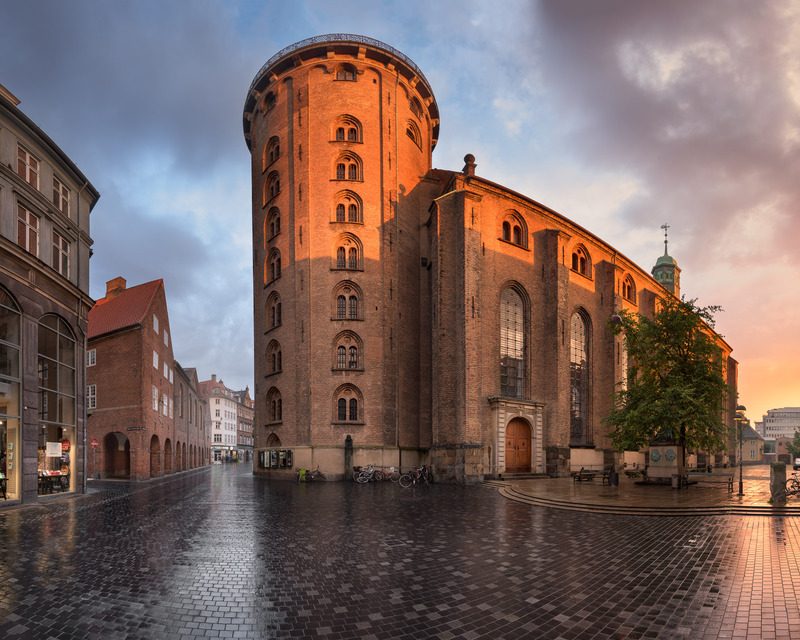 Copenhagen’s Round Tower is one of those places. It’s not an easy structure to miss; it’s one of the most distinctive buildings in the city and is located in the city center. The tower is popular with tourists, and a climb to the top reveals some of the best views of the city, making it a staple of guidebooks. But as I prepared to photograph the tower, I found myself thinking more about its history than its striking facade or the views from the observatory. There was a time when Copenhagen was one of the world’s leading centers for the study of astronomy. Astronomy was a newly popular field of study, and countries across Europe established national observatories to further study the new field. Denmark’s preeminence in the field was due largely to the work of Tycho Brahe, a nobleman, astronomer, and writer. In the late 1500s, Frederick II, who had an interest in astronomy and an appreciation for Brahe’s contributions to the field, ruled Denmark. During his reign, Brahe was something of a darling of the Court; Frederick even funded two observatories for Brahe on the island of Hven. The observatories, Uraniborg and Stjerneborg, were the most advanced of their day. Following the death of Frederick, his son became king. The new king — Christian IV — did not share his father’s interest in science and Brahe, whose political beliefs put him at odds with the monarchy, soon ran afoul of the new king. The famed astronomer was exiled from Copenhagen and the grand observatories, Uraniborg and Stjerneborg, were demolished. I think of this as I photograph the tower. I think of how the tower was born of a petty dispute, that the shame and sadness of Brahe are etched into the tower’s facade. I imagine the old astronomer, if he were alive today, looking out over the city from the top of the tower, amazed at its changes but grieving for what was lost.